Do you hate the commotion in the city this time of the year? Instead of feeling like Santa Claus, are you scowling like Scrooge? We completely understand it. A simple taxi ride takes four times as long as it should, assuming you can even find a taxi. Busses are full up at 7am. And you have to endure police stringing “do not enter” tape across streets near Rockefeller Center in the most simplistic and makeshift type of traffic management technique ever concocted. Help! we need a way to enjoy our city at this most magical time of the year. Enter Classic Harbor Line. I really love what they’re offering to get you off the city’s crowded streets and out of the crazy NYC commercial scene. 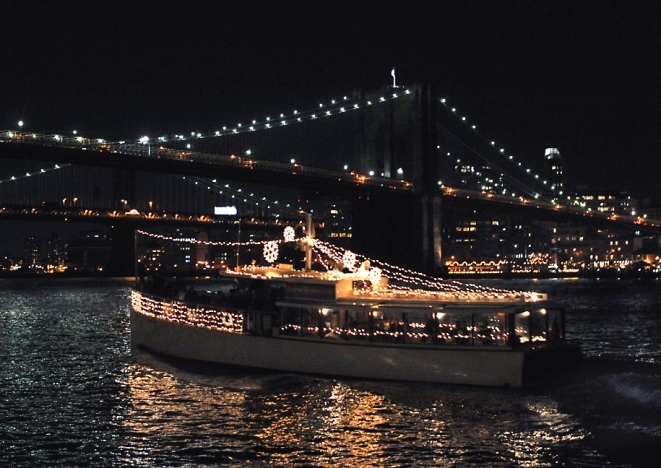 Grab your spouse, your significant other, your BFF and all of your family for a tour of the city decked out in its holiday splendor…. from the water. On a cruise leaving from Chelsea Piers (Pier 62, West 22nd Street and Hudson River), you’ll get to see the city lights on a one and a half hour sail, seated indoors in complete comfort, with live carolers or jazz musicians as your hosts. Pretty cool? Actually, quite warm. 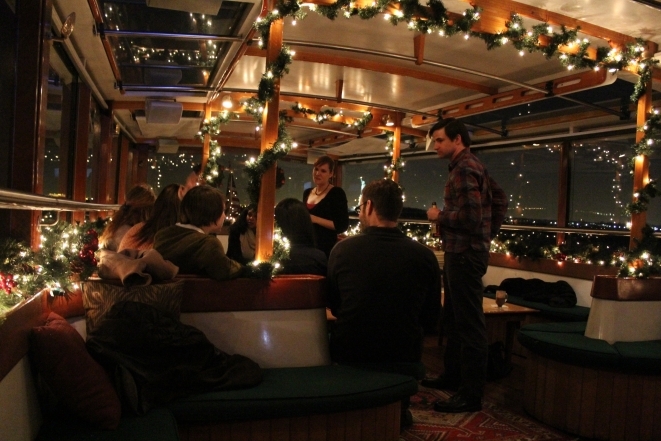 You’ll be back to singing “it’s a holly jolly Christmas” in a flash as you snuggle up in a heated back-deck salon on a 1920s-style sailing vessel. Aboard the Luxury Yacht Manhattan, you’ll soak in the scenery as you stay toasty with cocoa and cookie treats. (Adults have a choice of beer, wine, spiked hot cocoa or champagne as well). Battery Park, South Street Seaport, and the Financial District are your twinkling downtown sights, along with gorgeous views of Governor’s Island, The Statue of Liberty and Ellis Island. Depending on the weather and the course taken, you’ll also see some areas of Brooklyn and Queens, and, of course, the Manhattan skyline. This entry was posted on Saturday, December 20th, 2014 at 12:56 am	and is filed under Stuff to Do. You can follow any responses to this entry through the RSS 2.0 feed. You can leave a response, or trackback from your own site.